There are several ways you can insert templates in your project. You can insert layer and panel template in the Stage, Thumbnails and Timeline views. 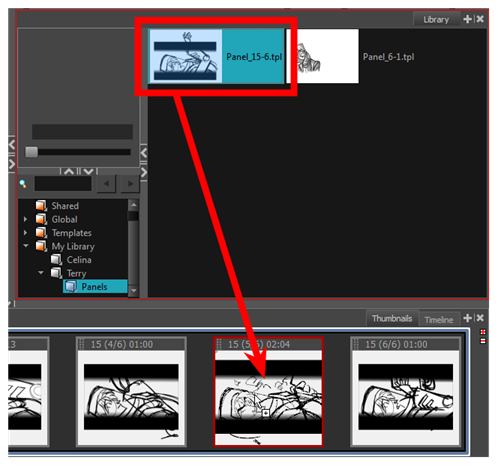 In the Thumbnails view, select the panel in which you want to insert the template. In the Library view, select the template you want to insert. Drag the selected template to the Stage view. If you drag a template of an entire panel into a selected panel, it will add all the contents of the template into the existing selected panel. Drag the selected template to the selected panel in the Thumbnails view. 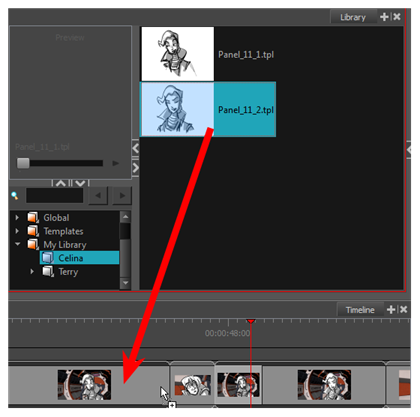 In the Timeline view, select the panel in which you want to insert the template. In the Library view, select a template to insert. Drag the selected template to the selected panel in the Timeline view. If you are inserting a sound clip template, drag the template into a sound layer in the Timeline view.